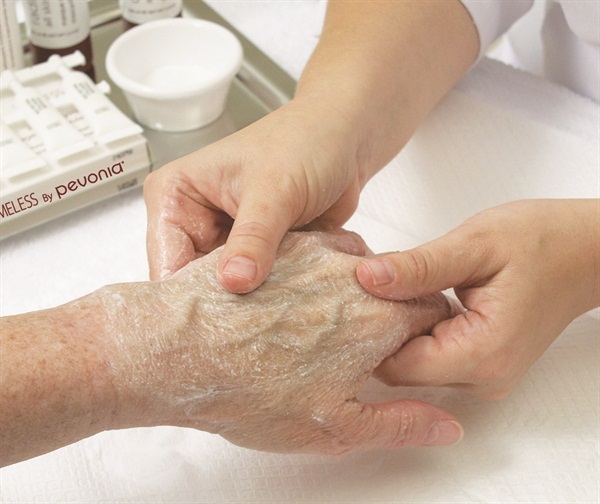 Increase your service offerings and revenue while providing your clients with hydrated younger-looking hands. 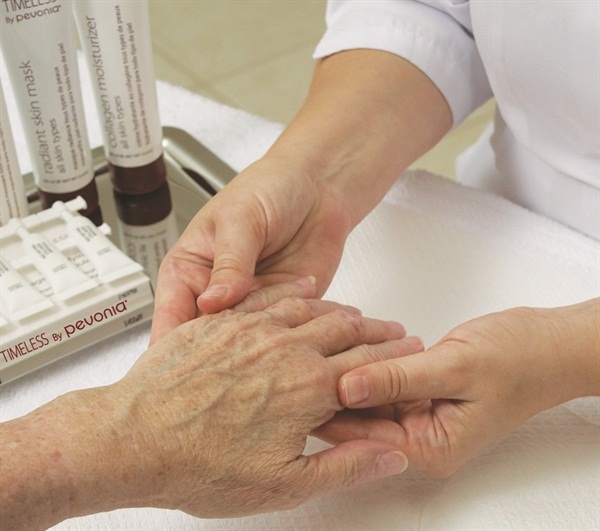 This anti-aging hand treatment from Timeless By Pevonia can be offered as a stand-alone treatment or manicure upgrade. 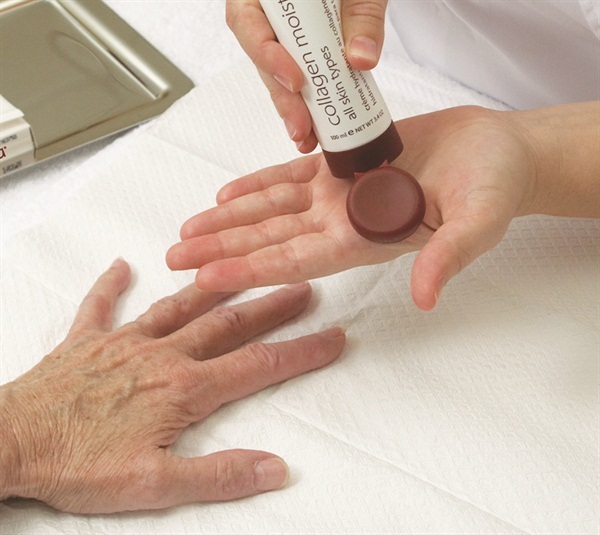 Increase your service offerings and revenue while providing your clients with hydrated younger-looking hands. All products used here are provided in the Timeless By Pevonia Professional Tool Kit and sold separately. 1. Use about one tablespoon of Timeless Silky Skin Cleanser and gently massage the client’s hands and wrists. Remove the cleanser using a moist sponge. Spritz Timeless Silky Skin Toner onto a facial cleansing pad and wipe the skin again to remove any remaining residue. 2. Dispense half a teaspoon of Timeless Gentle Foaming Scrub into a product cup and apply it to the backs of the client’s hands. Wet your fingertips with warm water and work the product using circular motions. Then remove the product with a moist sponge. Place a quarter teaspoon of Timeless Foaming Gel Cleanser in your damp hands. Lather the client’s hands and then remove excess foam with a dry facial pad. Wipe the skin again using a moistened sponge and apply Timeless Silky Skin Toner to the hands with a pad. 3. 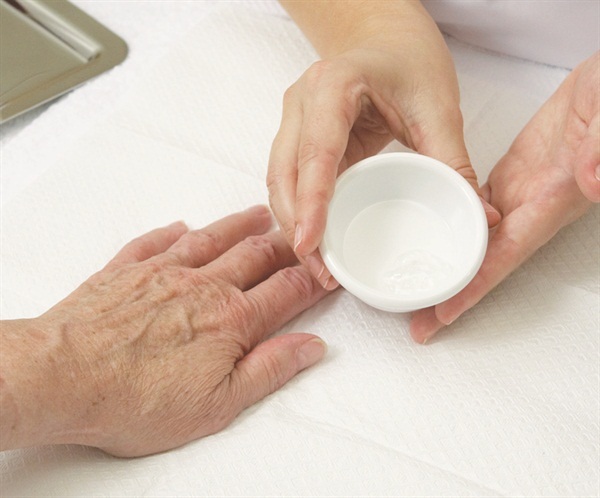 Apply the prepared collagen ampoule solution to your client’s hands, making sure to leave about one quarter remaining in the cup. Apply starting at the back of the hands and then spread evenly all over. Proceed with a massage until the product is completely absorbed. 4. Squeeze one teaspoon of Timeless Radiant Skin Mask into a product cup. Using a facial brush, apply the mask with long strokes on the back of the hands. Leave the mask on for 10 minutes. Then use a moist sponge with cold water to remove the mask by wiping with long, firm strokes. After removal, proceed to tone the skin with Timeless Silky Skin Toner. 5. Apply the remaining quarter of the ampoule all over the client’s hands, palms, and wrists, massaging gently until the product is completely absorbed. Apply a small veil of Timeless Collagen Moisturizer over the hands. 6. To complete as an anti-aging manicure, proceed with the appropriate manicure steps.